In a previous article, VirtualBox with SOA, BPM, OSB and BAM in 33 minutes, i described how you could quickly create a new Oracle VirtualBox image from scratch with SOA 12cR1. When following the instructions in this article you get almost the same result, only differences are that you will have SOA 12cR2 installed with Oracle StreameXplorer. Because the preparation is almost the same, follow the instructions in the VirtualBox with SOA, BPM, OSB and BAM in 33 minutes, till the step “Install Oracle Linux”. Only use the Github repository reddipped/soa12cR2install instead of reddipped/soa12cR1install. Continue from there with the following steps to complete the installation. Now Linux is up and running, logon as Oracle and run the installation script for Oracle DB Standard Edition 2 from the shared folder soa12cR1install/Db12cSE2. Install Java 8u65 by executing the following commands as Oracle. When installing oracle products silently the location of the oracle inventory location should be created. This file specifies the location of the Oracle Inventory directory where the Installer creates the inventory of Oracle products installed on the system. Just cut-and-paste the following instructions as user Oracle. Read the complete article here. Attend our January edition of the SOA & BPM Partner Community Webcast live on January 26th 2016 16:00 CET. 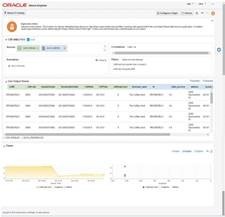 The Oracle Stream Explorer platform provides a compelling combination of an easy-to-use visual façade to rapidly create and dynamically change Real Time Event Stream Processing (Fast Data) applications, together with a comprehensive run-time platform to manage and execute these solutions. I’ve blogged about how to consume REST with Oracle Stream Explorer in previous posts Exploring data streams with Oracle Stream Explorer – part 1 and Exploring data streams with Oracle Stream Explorer – part 2. This time we are going to take a look how to configure stream explorer to send events to a REST service. Configuring a target is as simple as a few clicks. Just click the "Configure a target" button, select REST from the dropdown and enter your REST service url. Note that building the service is not in the scope of this blog, suffice to say it should expect parameters which your exploration emits. Read the complete article here. In this article, we will look at the very common interaction between Stream Explorer and JMS. JMS is a commonly used channel for decoupled exchange of messages or events. Stream Explorer can both consume messages from a JMS destination (through Stream) and publish findings to a JMS destination (with a target). The use case we discuss here is about temperature sensors: small devices distributed over a building, measuring the local room temperature every few seconds and reporting it over JMS. The Stream Explorer application has to look out for rooms with quickly increasing temperatures and report those over a second JMS queue. Note: this article describes the Java (SE) code used for generating temperature signals. This class generates temperature values (in Celsius!) for a number of rooms, and publishes these to the queue temperatureMeasurements. At some random point, the class will start a fire in a randomly selected room. In this room, temperatures will soon be over 100 degrees. Also in this article is Java class HotRoomAlertProcessor that consumes messages from a second JMS Queue. Any message received on that queue is reported to the console. Our objective in this article is to read the temperature measurements from the JMS Queue into a Stream Explorer application, calculate the average value per room and then detect the room on fire. This hot room should then be reported to the JMS Queue. 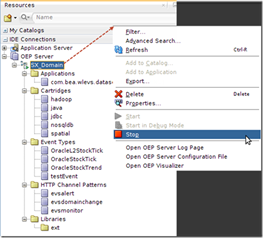 Open Stream Explorer and from the Stream Explorer Catalog page, create a new item of type Stream. Select JMS as the source type. Read the whole article here. Oracle Stream Explorer is a business user friendly tool enabling you to create innovative, sophisticated, real time, streaming analytics applications in minutes. This playlist will give you an introduction to Oracle Stream Explorer as well as taking you through some basic and more advanced tasks. Watch the videos here. The brand new Oracle Stream Explorer 12c has been released today. The idea behind this product, which gives it a lot of relevance, is to bring simplicity, usability and enterprise readiness to Event Processing. We have talked before about Industrial SOA, and the impact that such concepts as: IoT, Social Media, Mobile, Fast Data bring to the table. With this in mind, we have to acknowledge that enterprises nowadays, constantly find themselves dealing with huge, endless amounts of data in motion. Oracle’s pitch in this sense, with Oracle SX, is to put this Real Time Streaming Intelligence in the hands of Business Users and Integrators, who can instantly determine the business value of the information and its relevance as business opportunities and threats. As you can see, Oracle SX looks really cool! !, and the first thing we must say in this regard, is that the product’s user interface has been entirely built using Alta UI. Hence we are practically guaranteed a very favorable user experience which is not only nice, but will also help us position the tool in our clients. Functionality-wise, SX abstracts event processing capabilities to a degree in which the user requires no knowledge whatsoever of Real Time Event Driven Architectures, Continuous Query Language (CQL), Java Event Server or the semantics of Event Stream Processing Application Models. Basically, Stream Explorer introduces three main concepts that we must understand in order to configure the scenarios we want: Read the complete article here.